Amid its blockbuster tech litigation with Waymo, the Google self-driving car project, Uber recently showed off the first of its long-haul automated trucks for its new endeavor UberFreight. But the ride-hailing giant won’t be kicking around the upstart automated trucking market on its own: It’s nemesis Waymo is also working on self-driving trucks. BuzzFeed figured this out after it saw a photo of a truck, and the company said its manually testing a single semi on public roads for data collection purposes. Waymo confirmed its next ambitious project Thursday, reports Reuters. Waymo, which is looking to expand its self-driving car efforts, expects autonomous vehicles to be able to take over longer distance trucking in the coming years, while allowing human drivers to handle local pickup and delivery routes. 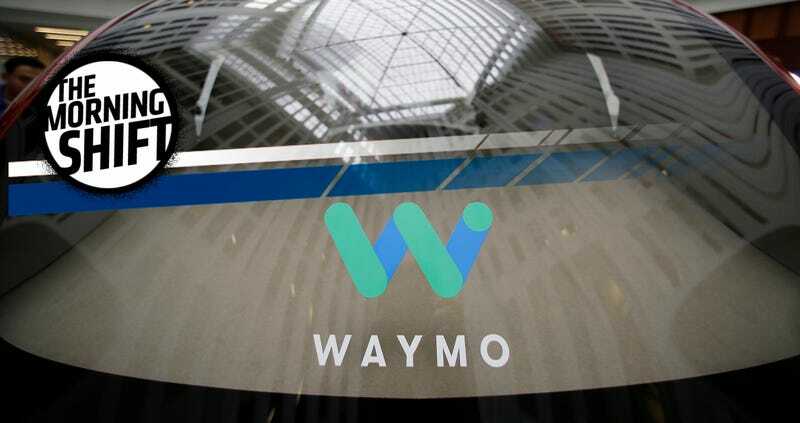 “We’re taking our eight years of experience in building self-driving hardware and software and conducting a technical exploration into how our technology can integrate into a truck,” a Waymo spokesperson said in a statement. The U.S. has three million truck drivers who haul 70 percent of the nation’s freight. While it may seem neat that autonomous trucks are making beer runs, automation can wipe out a wide swath of drivers, and that’s a question we should start grappling with now. Remember yesterday? When President Trump announced he’ll withdraw the U.S. from the major Paris Climate Accords? That hasn’t sat well with major business leaders and officials across the nation, and now California says it’s turning to China for help on curbing automotive pollution, according to Bloomberg. In China, Brown will spread the gospel of California’s auto policies, including a state rule requiring an increase in annual sales of zero-emission vehicles powered by batteries or hydrogen. The Chinese government is weighing a similar requirement for automakers competing in the world’s largest vehicle market. Surely, this’ll win the praise and adoration of The Donald. BMW AG and Mercedes parent Daimler AG’s U.S. sales in May dropped 11 percent and 8.2 percent, respectively, the German automakers said Thursday. South Carolina and Alabama-assembled sport utility vehicles were exceptions to a month of weak total deliveries, with demand jumping for BMW X3 and Mercedes GLE models. The results reveal a blind spot in Trump’s renewed rhetoric that German automakers sell too many vehicles in the U.S. For decades, BMW and Mercedes have been boons to the local economies of Republican-leaning states where they operate plants. Appetite for models built in those factories is growing both among American and overseas consumers, supporting U.S. exports. A “blind spot,” you say? Bloomberg coming in strong with the subtle auto references today. For light-vehicles, they slipped! Again! Ford, Honda, GM, you name it, they’re down, according to Automotive News. U.S. light-vehicle sales slipped 0.5 percent in May, even with higher discounts and strong truck demand, as the auto industry prepared to limp from one key selling season to another. The seasonally adjusted, annualized rate of sales fell to 16.7 million, down from 17.2 million in May 2016, on weaker fleet volume across the industry. A survey of 11 analysts by Bloomberg in late May put the average estimate for May’s SAAR at 16.8 million. Intel defines the passenger economy as “the economic and societal value,” including products and services “that will be generated by fully autonomous pilotless vehicles.” It will most likely lead to a sharp decrease in the ownership of personal vehicles as people begin to adopt the mentality of “mobility-as-a-service” in which they arrange for transportation on an as-needed basis. Companies will no longer be handcuffed by driver shortages, as pilotless fleets boost efforts for industries like package deliver and long-haul transportation. Of the $7 trillion impact predicted by Strategy Analytics, $3 trillion will be generated by businesses utilizing mobility-as-a-service. Apartment buildings, hotels and condominiums will likely provide driverless vehicles to tenants and guests as an amenity, and companies could do the same as a perk for employees. For car lovers who don’t want to ditch their personal vehicle, the study offers an optimistic take—if they’re willing to share their ride: new “personal vehicle sharing networks,” could make privately owned self-driving car available for ride-sharing. Sounds fine, if you like the idea of Turo. So, the takeaway—at least for now—is that the impending rollout of autonomous trucks will wipe out a significant workforce in the U.S. What’s your best idea to solve that problem?